Qualifying the published emails as “hacked” forgets that Assange and former and present members of the U.S. Intelligence Community have emphatically stated the documents were leaked from an inside source. Greenwald rightly notes the only feasible reason to perceive that evaluation of the future Trump administration as even guarded praise of the president-elect is because it came from Assange — the Democratic Party’s Enemy Number One. “The fact that Assange sees possibility for exploiting the resulting instability for positive outcomes, along with being fearful about ‘change for the worse,’ makes him exactly like pretty much every political and media organization that is opportunistically searching for ways to convert the Trumpian dark cloud into some silver lining,” the Intercept co-founder writes. 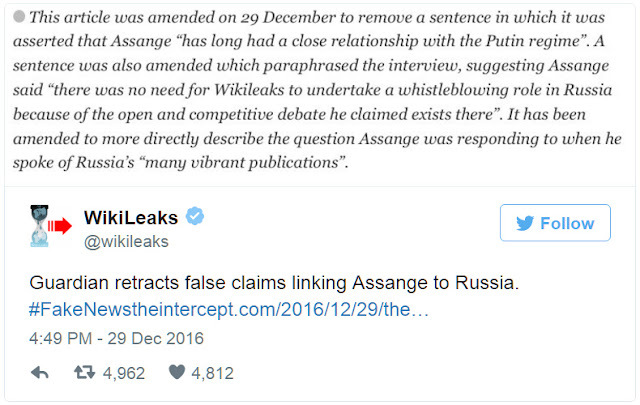 As Greenwald writes, however, the single evidence of an Assange link to Putin is that he conducted a series of eight interviews broadcast by RT — in 2012. 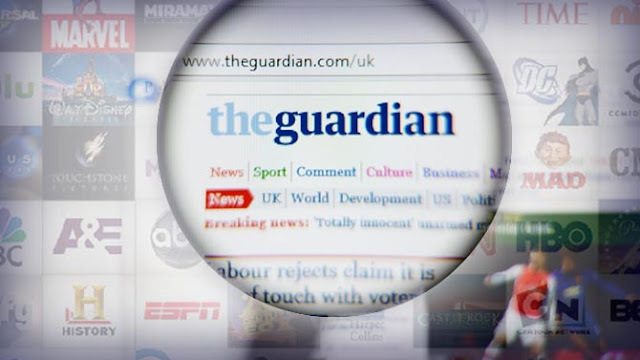 In fact, that claim so misrepresented the truth, the Guardian subsequently retracted that sentence entirely and edited Jacobs’ assertion about whistleblowers being unnecessary. Russia, Assange noted to la Repubblica, like other non-Western nations has its own cultural specificities — and governmental strictures — regarding the exposure of corruption and criticism of political figures. He explains the obvious language barrier makes the outlet at least somewhat useless as a vehicle to publish Russian documents and thus not as viable for Russian whistleblowers — who already have better options located in that country. Indeed, these wholly fraudulent assertions were duly heralded by the obsequious corporate press, whose servile devotion to all narratives government-approved — particularly those Russophobic — long ago forgot all journalistic duty to report the truth. In plain terms, this is Fake News — at its naked worst.